Since I’ve introduced two savory egg dishes, I’m compelled to do a dessert. I am, after all, a sweet over savory foodie. My third egg recipe is another classic– this time from France. Whenever it’s available for dessert at a French restaurant, Kurt and I both order it, right away, since it takes a while to make and must be served immediately. Got it? 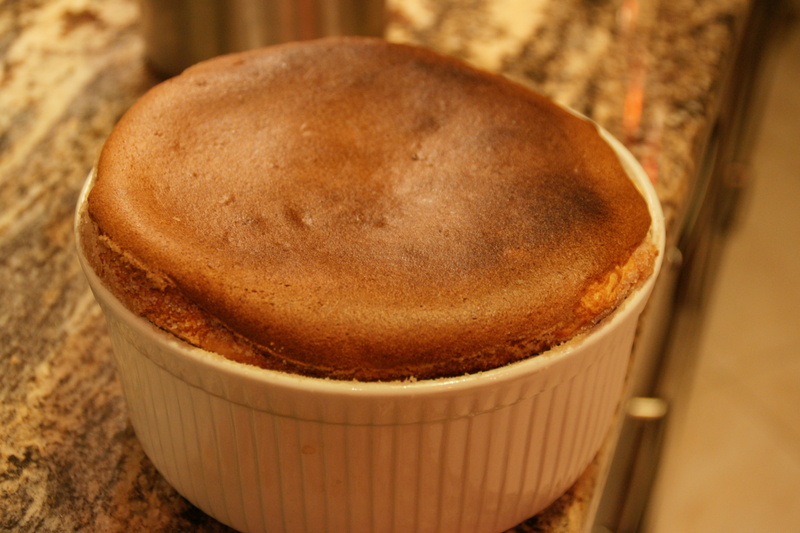 Yep, it’s Grand Marnier soufflé! So light and airy; I love the moment the waiter brings it to the table, pokes a hole in the center and pours in a bit of crème anglaise. For this version, I turned directly to the Julia Child’s recipe in Mastering the Art of French Cooking; I’ve modified the recipe slightly, e.g., just orange zest instead of sugar cubes– do they even produce sugar cubes these days? A soufflé, whether sweet or savory, is a two-part process. 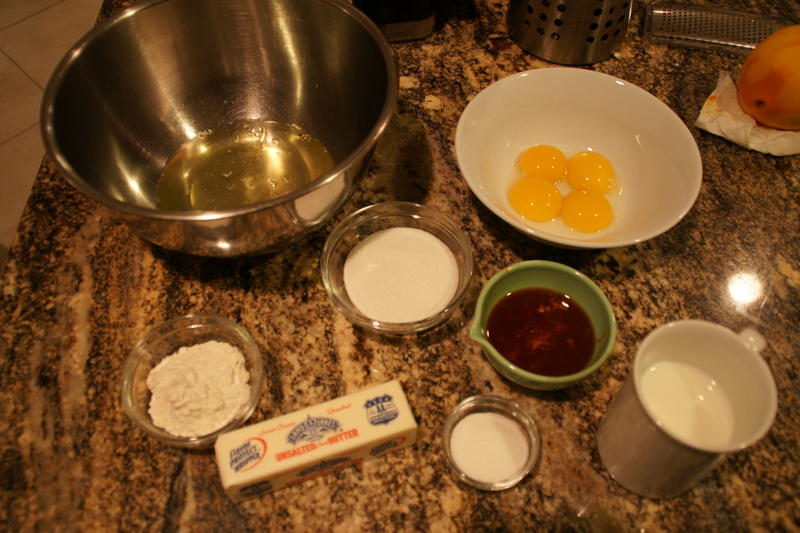 First you make the base; flour and milk are thickened together, then enriched with egg yolks, butter and flavorings. 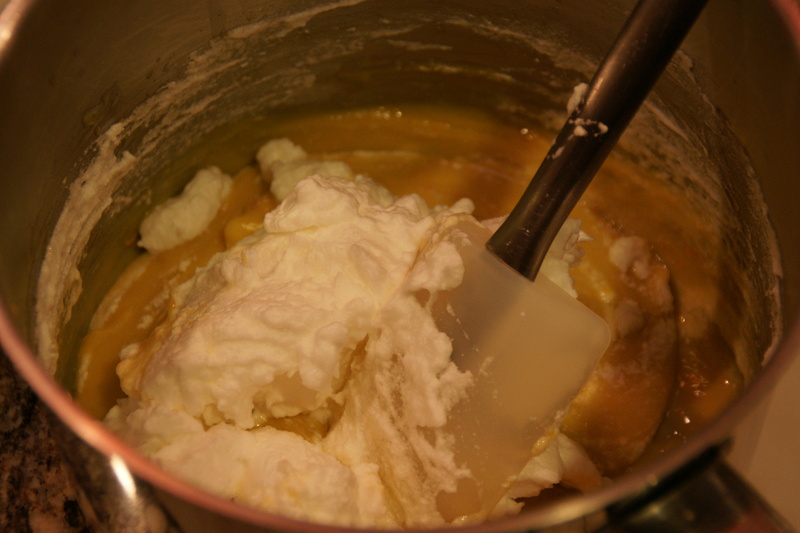 Then you beat egg whites with a little sugar until they’re stiff, and add them quickly to the base. It’s important to remember to first add just a little bit of the egg whites to lighten the base before adding the rest of the whites. Preheat the oven to 400 degrees. Butter a 6 cup casserole dish with unsalted butter. Pour a little sugar into the dish and tilt the dish to coat the bottom and sides with the sugar; pour out any excess sugar. Set dish aside. The most “exotic” ingredient is the Grand Marnier. Everything else is a pantry or dairy item. Place the flour into a heavy-bottom pot. 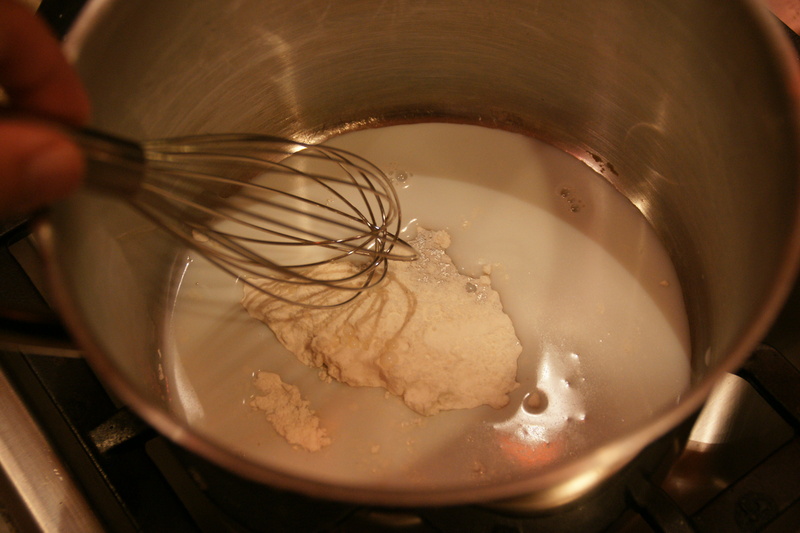 Add a little bit of milk to the flour and whisk to blend. Continue to gradually add the milk while whisking. Add the sugar and whisk again to dissolve. 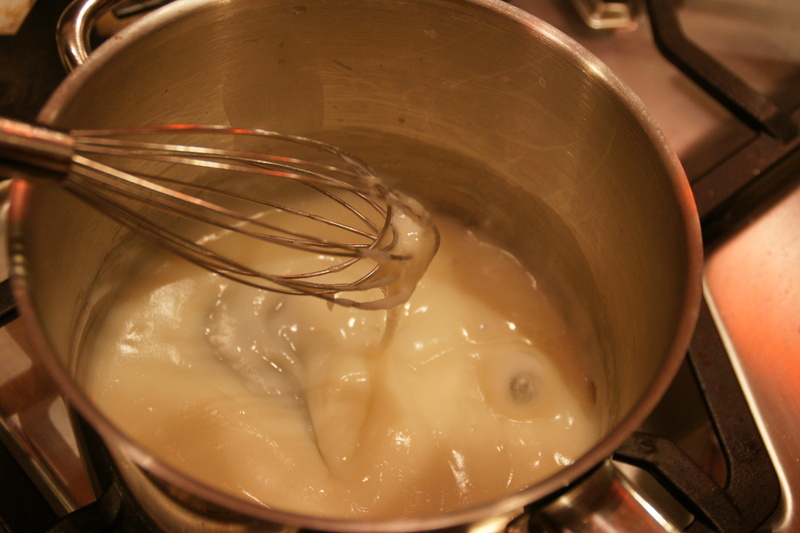 On medium high heat, whisk the milk mixture until it thickens and begins to boil. Let the mixture boil, stirring, for a minute or until very thick. It looks gross, like wall paper paste. Take the pot off-heat and beat until slightly cooled. 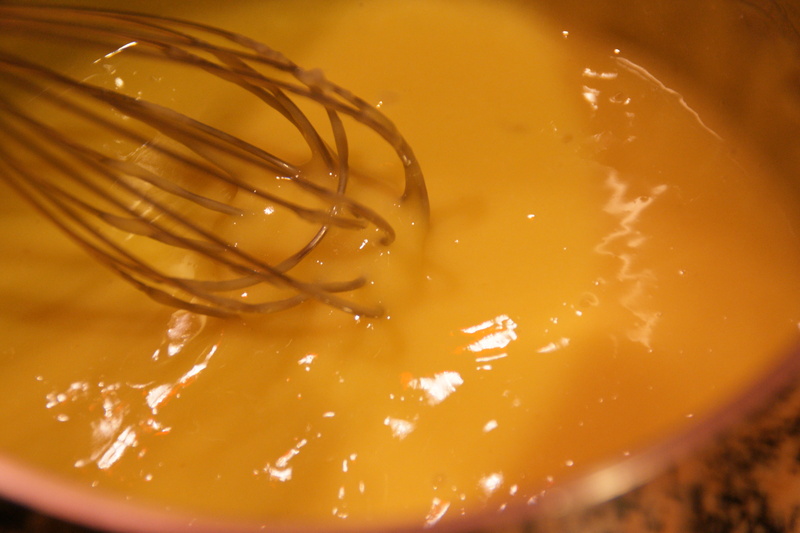 Add the egg yolks, approximately one at a time, whisking well after each addition. This is after the fourth yolk was added; it looks like a custard base now! 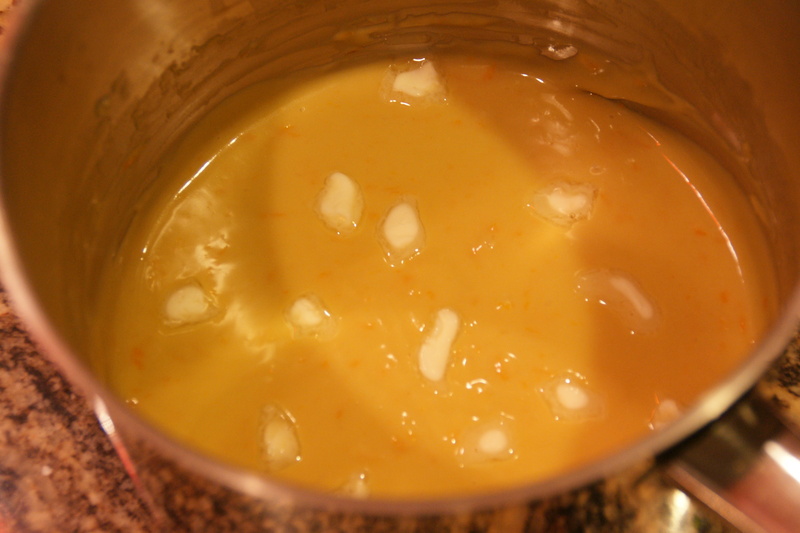 Beat in half the butter, then add the vanilla, orange zest and orange liqueur. Dot the surface with the remaining half to prevent a skin from forming while you beat the egg whites. In a large bowl, beat the egg whites with a pinch of salt until soft peaks form. Add the sugar and continue to beat until whites are glossy and stiff peaks form. Add about one-fourth of the egg whites into the egg base; this lightens the base so the remaining whites can be added without too much deflating. Lighten the base first with some of the whites! 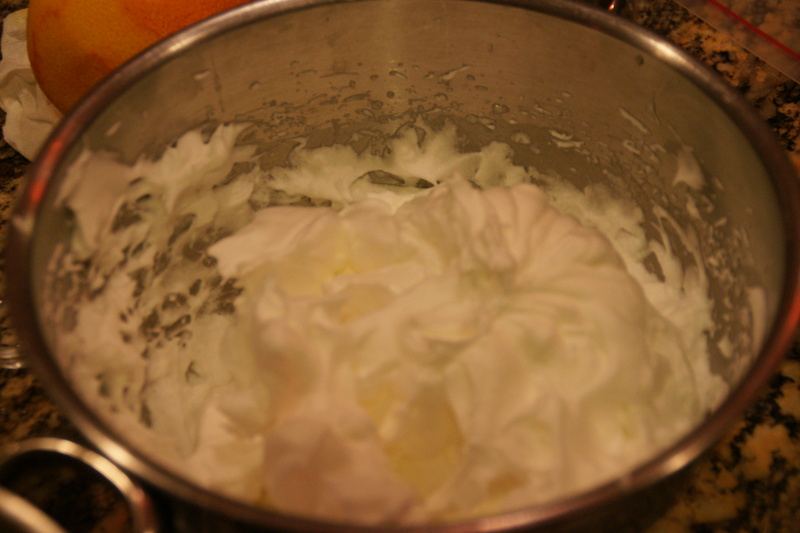 Add the rest of the egg whites and fold gently and quickly. Pour the mixture into the prepared dish. Make sure there is at least 1 1/2 inches between the surface of the souffle mixture and the rim of the dish (if there’s not enough room, the souffle will spill over the rim while baking– yuck). 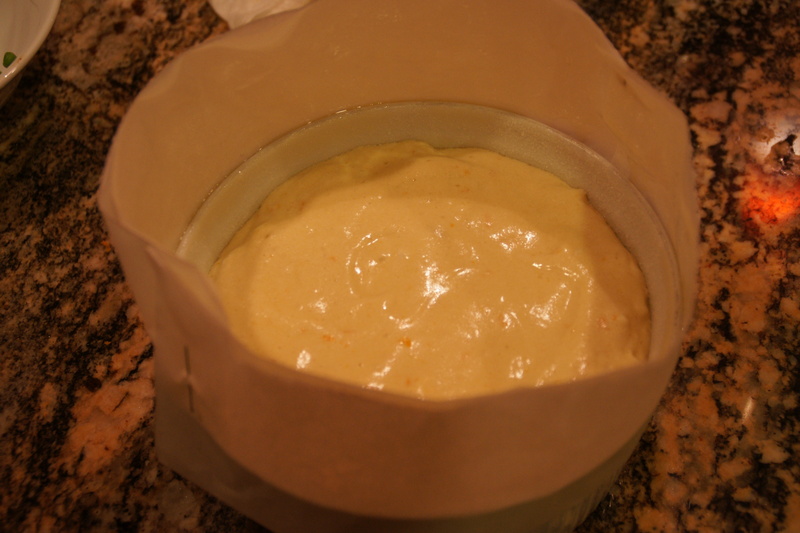 As you can see, I didn’t have enough headroom, so I had to make a collar out of parchment paper. All I did was take a couple of straight pins (don’t tape as the oven is FOUR HUNDRED degrees) to attach the pieces of parchment together to make a long strip, then sprayed one side with cooking spray (which would be the “inside” of the collar). I used another set of pins to connect the ends. (By the way, you can get to this step and wait up to an hour before baking–BUT remember to cover the souffle with a pot). Bake in the preheated oven for 30 to 35 minutes. Test to see if the souffle is done by inserting a thin knife into the center of the souffle; if it comes out clean, the souffle is done. Serve immediately if you want the presentation effect. (Clearly I did not). 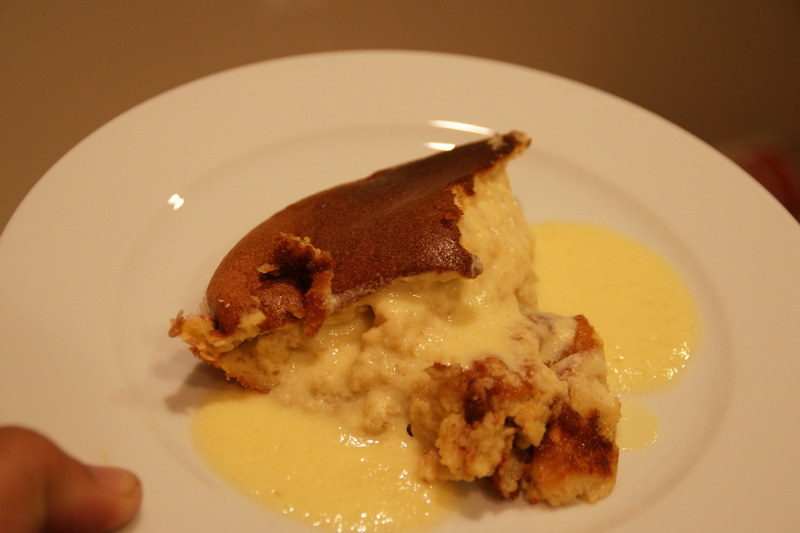 I waited too long to take the picture (I was working on the creme anglaise), and the souffle has begun to deflate. You can serve the soufflé as is or prepare crème anglaise to pour into the center of the hot soufflé when it’s served. I follow the recipe in Julia’s MAFC. Delicate orange flavor with a rich and creamy vanilla sauce.